Landscape Lights (Green / Red, with Remote) (LL01-RG-R) by Viatek®. Enjoy the outdoors with the best gadgets and electronics and let them do the job for you. Designed with precision and functionality in mind, this accessory ensures outstanding performance and easy use which makes it the perfect deal for your ultimate satisfaction. 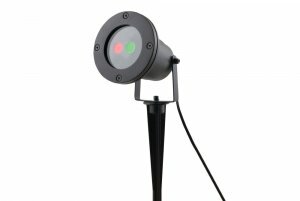 Night Stars Landscape Lights are decorative lights that are ideal for both indoor and outdoor use. It projects points of brightly colored lights onto walls, dance floors, landscapes, pools, gazebos, etc. Create an instant atmosphere for parties and entertaining or add a splash of color and interest to your home, yard, or garden. Projects red, green, or a combo of the two colors as well as an optional flash/pulse setting. The included Radio Frequency remote lets you control your Laser Light from anywhere in and around the house (not just close by to the light). The built-in timer runs for 2, 4, 6, or 8 hours and is also programmed from the remote. DO NOT PLUG IN LASER UNIT UNTIL PROMPTED IN THE STEPS BELOW. If you already have, unplug it and then follow the steps below, in order. First, install the included 23A battery in the remote. To test the remote’s battery connection, press any button and the LED will illuminate for 1 second. If the LED does not illuminate, check to make sure you have installed battery according to the correct polarity.